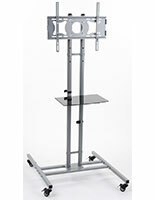 These monitor stands for 37" - 65" screens are the ideal way to move and display widescreen TV's. 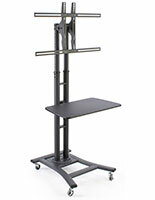 The aluminum carts are designed for maximum durability and portability with the use of rolling and locking wheels. 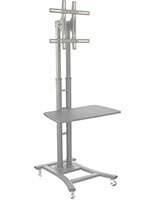 Each silver finish stand features a VESA-compatible mounting bracket that can be tilted for maximum visibility. 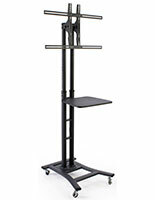 Each adjustable height AV fixture can hold up to 110 lbs. 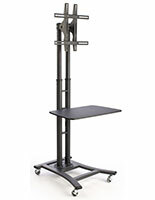 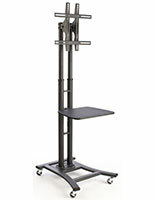 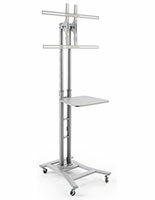 safely and has a 28" shelf to hold additional equipment, accessories, or presentation materials as needed. 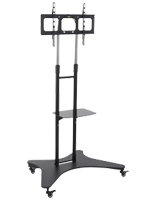 These mobile presentation stands are a great choice for use at off-site promotional or sales events, trade shows, or in offices. 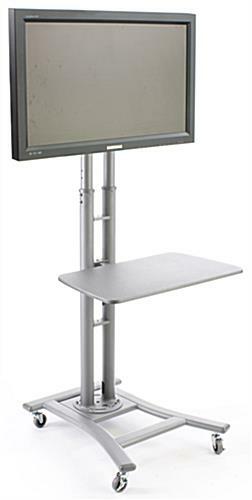 The height adjustable mounts help ensure visibility for presentations or digital advertising displays as well as allowing use as workstations in healthcare or training environments.